The Goop founder released a new cookbook that focuses on simple, quality food. Gwyneth Paltrow is serving up her most ambitious cookbook yet with over 100 recipes and meal plans that offer taste, simplicity and targeted health benefits. 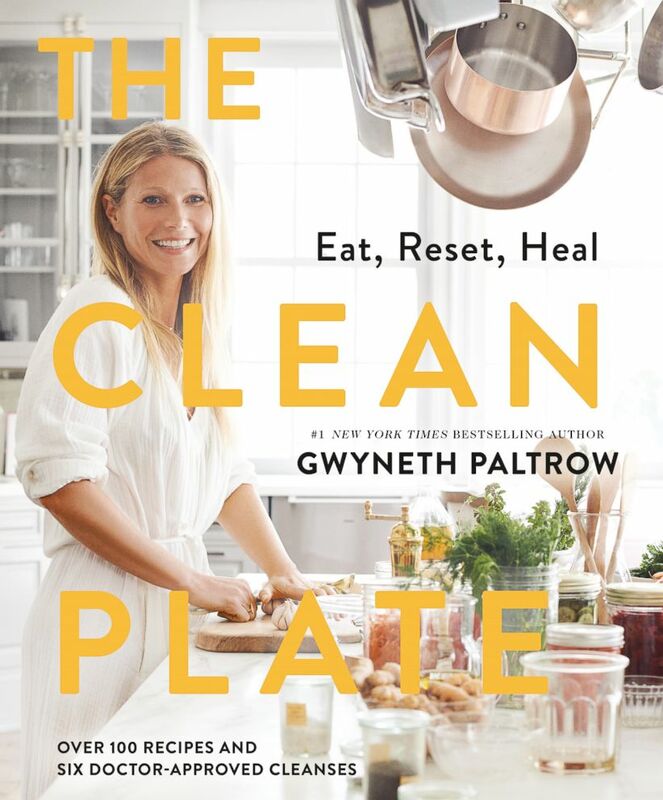 "The Clean Plate: Eat, Reset, Heal" perfectly aligns with the Goop founder's focus on appealing and balanced recipes and includes support from her team of nutrition experts and doctors. (Ditte Isager/Grand Central Publishing) Gwyneth Paltrow's new cookbook "The Clean Plate" is full of recipes to eat, reset and heal. Paltrow shared two of her clean ingredient recipes with "GMA." 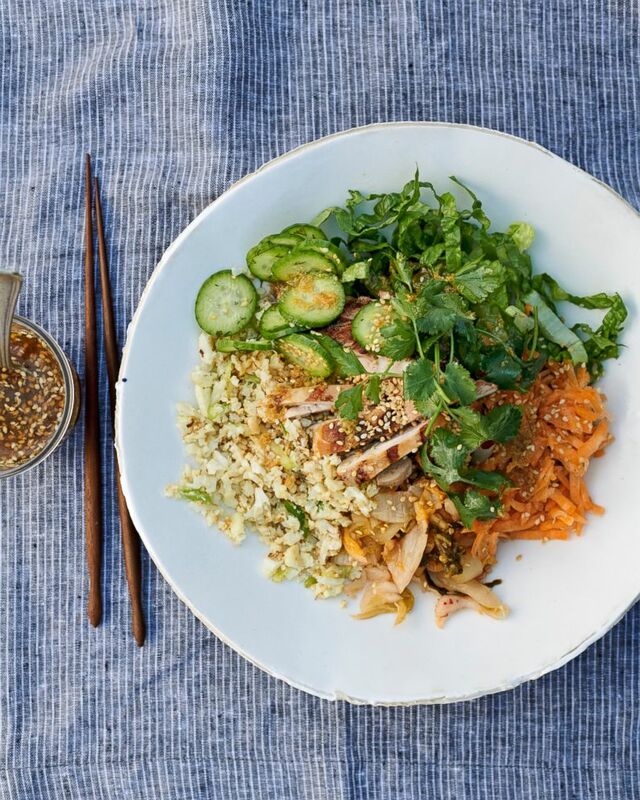 (Copyright 'The Clean Plate,' Photographs by Ditte Isager) Gwyneth Paltrow shares her teriyaki chicken bowl recipe from her new cookbook, "The Clean Plate: Eat, Reset, Heal." His new cookbook highlights quick and easy cooking with simple recipes. The celebrity chef shares recipes from his latest cookbook. To make the teriyaki chicken, combine the chicken thighs, garlic, ginger, salt and coconut aminos in a small bowl and marinate at room temperature for 10 minutes. Heat a grill pan over medium-high heat. Brush the pan with a little olive oil, add the chicken, and cook for five minutes per side, or until firm to the touch and cooked through. Transfer to a cutting board and let rest for at least five minutes. Meanwhile, prepare the cauliflower rice, then stir in the toasted sesame oil and scallion. If you don't have a food processor to make cauliflower rice, Paltrow suggests using an old school box grater. Divide the cauliflower rice between two bowls and top each with half the romaine, kimchi, carrot and cucumber pickles. Chop the grilled chicken and season with salt, if needed. Divide the chicken between the bowls and garnish each with cilantro leaves and sesame seeds. Pour a couple of tablespoons of the dipping sauce over each and serve with more sauce on the side. 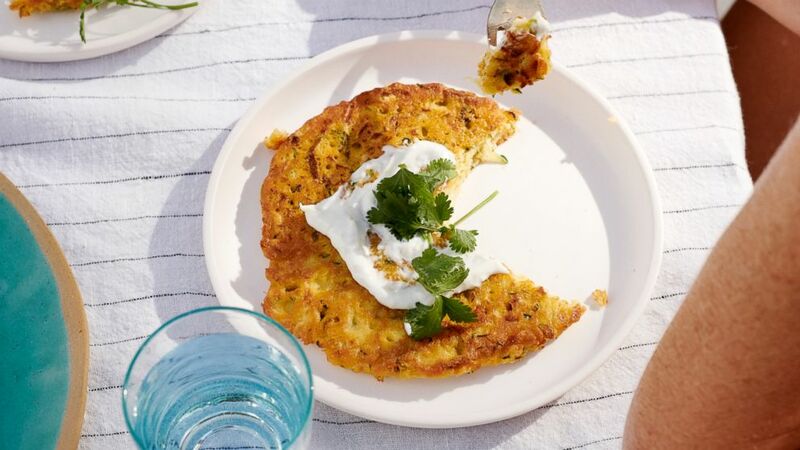 (Copyright 'The Clean Plate,' Photographs by Ditte Isager) Gwyneth Paltrow shares her cauliflower, pea and turmeric soccata recipe from her new cookbook, "The Clean Plate: Eat, Reset, Heal." In a medium bowl, whisk together the chickpea flour, water, olive oil and kosher salt. Add the cauliflower florets, mashing them a bit with a fork. Stir in the peas, lime zest, scallions and turmeric. Heat an 8-inch nonstick skillet over medium-high heat. Add about one tablespoon olive oil, and pour in half the batter. Cook for about four minutes, or until the bottom is starting to crisp, then flip the pancake and cook for three minutes or so on the second side. Transfer the soccata to a plate and cook the second soccata. In a small bowl, toss the cilantro, mint and parsley with the lime juice, a little olive oil and a pinch of flaky salt. Top each soccata with some sliced avocado, if desired, and garnish with the herb salad. Excerpted from the book "THE CLEAN PLATE: EAT, RESET, HEAL" by Gwyneth Paltrow. Copyright 2019 by Gwyneth Paltrow. Reprinted with permission of Grand Central Publishing. All rights reserved.